Are you ready to move in 2017? Guruji called. Then 150 practitioners came together in unison, with one unified intention. This is how I remember the times I spent with Sri K Pattabhi Jois in the last decade when he came to teach in London. The call, the response. The joining together in breath and attention was palpable when the guru called us up. That booming call has stayed with me. I make the same call each morning to the practitioners at SYL when we come together to chant at 07:10am. A unifying call to attention, to come together and chant. To remember, individually and collectively, why we are here. For just a few moments in the practice room, to join together as one and remember why we come. Samasthiti is commonly translated as sama (equal) and sthiti (standing). We are standing equally. Balanced and still. We are noticing the complex framework of what it actually means just to stand with equal balance, equal stillness, in that one moment. We are seeing how balanced and still we are in our lives. In fact we could also say the opposite is true and that we can also notice how out of balance we actually are. We notice it so we can perhaps begin to find balance. In ashtanga vinyasa yoga, samasthiti is held at the beginning and end of each posture*. Because we are only ever in samasthiti for one breath we can find that the posture is both a transition and a point of reference. And that one breath point of reference we find ourselves in is an exhale. A letting go. We are returning to equal standing, to balance and stillness. To neutral. Where neutral means to see what opens up when we let go into ourselves. It is from here that we move. With the understanding of neutral the meaning of samasthiti can be a deep practice all of its own. The intention when you begin your practice, from standing, creates the tone of what is to follow. When you are at the front of the mat, in neutral, are you ready? Samasthiti – then be ready. But be ready for what? I see samasthiti not only as a posture but as an awareness practice all of its own. In fact as awareness itself. And the awareness of ourselves in posture is really what I feel we are cultivating through our yoga practice. The awareness of samasthiti is the still and balanced focus of the whole practice that follows. Notice where your attention moves. And what moves your attention. See that this movement is subtle and that practice moves us in a deep way. We know the body moves. Look deeper. Feel deeper. For me, this is the practice we are taking off the mat. The deeper held focus of seeing that it’s not only my yoga practice I am being ready for. I am cultivating that same readiness in my wider life too. The ripple of ‘Samasthiti – Ready to move’ is the real teaching that I take from my yoga practice. That I am ready for the movement of change whenever it comes. Ready to meet people, ready to feel, ready to engage, ready to listen, ready to truly understand, ready to act, ready to be moved by the whole damn world. And ready to see it all, standing equally. Remembering this is key. Yoga practice helps you see that your life is always moving. It’s also a training to be ready. For me this time of year is incredibly poignant. 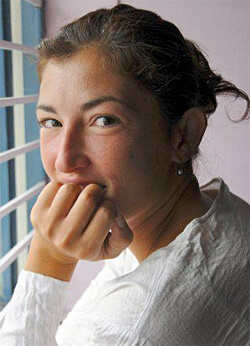 It is now 5 years since Ozge Karabiyik, co-founder of SYL, passed away (2nd January 2012). I remember a dear dear friend, a colleague, a practice buddy, someone I could call a sister and a beautiful practitioner and teacher. Time flies. What seems like yesterday turns into today and will turn into tomorrow. But at the same time it doesn’t seem to move. She remains these things in my memory. When I think of her she continues to move me. She helps me to be ready for my life. In each moment. Being ready for all that comes is key. How will you move in 2017? Are you ready? *On the understanding that you’re practising the full vinyasa method based on the full vinyasa count. We offer Ashtanga yoga assisted Mysore self-practice classes every Monday to Friday 6:30am-10:00am. We invite all practitioners to come join us on the mat, start with samasthiti and find your transition from stillness to movement.